With the start of the new school year approaching, it is time to start getting organised. The school uniform is bought, washed and ready to go. The school shoes are sitting by the front door looking smart with new school bags eager to be filled with books and PE kits. Lunch bags have been placed in the kitchen and ready to be filled with delicious sandwiches, sausage rolls and snacks needed to get Roo and Tigger through the school day. Over the years we have tried various things within their lunch boxes and one of the things that Roo asks for each time we go shopping is Hartley’s Jelly Pots. They are the perfect size for children’s lunchboxes, coming individually packaged and in a wide range of flavours to keep little ones happy. This summer Hartley’s have an amazing collect the lid offer. 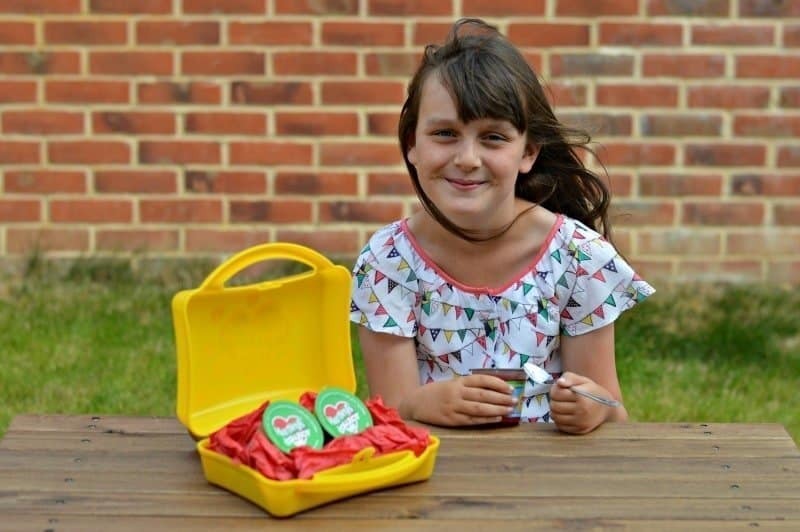 By collecting 12 special edition green lids from across the No Added Sugar Jelly Pots (115g) range, you are able to claim a free Hartley’s lunch box and stickers. To claim the exclusive lunchbox simply head over to Hartley’s website www.hartleysfruit.co.uk. Each one comes complete with a sticker sheet of Hartley’s much-loved characters and a sticker alphabet for children to personalise their lunchbox. Equipment – ensure that you have enough lunch boxes, drinks bottles, and bags. If you don’t want to be washing everything each evening (I pop ours in the dishwasher so it might not be put on again until the morning) then ensure you have at least two of everything per child. Variety – Try wherever possible to introduce variety into lunch boxes. Whether it’s a different flavour yoghurt, jelly pot or sandwich filling. Mixing it up will hopefully make them enjoy eating their lunch and less liking to come home with a half ate lunch box because they didn’t fancy it. Preparation – Prepare lunch boxes the night before. I tend to make up the lunch boxes as I’m waiting for the tea to cook. Simply pop them in the fridge complete with juice bottles so that everything is nicely chilled for the morning (perfect for the warmer days). Responsibility – Both Roo and Tigger understand that they have a responsibility regarding their lunch boxes. They need to ensure that they take it to school, bring it home from school and then empty and wipe out the inside of the lunch bags. Whilst I am happy to prepare their lunch boxes and give them a reminder as we head out the door, I don’t want to be the mum that is running back to the school with their lunch boxes because they forgot them. What are your school lunch box tips? Really clever tips. Commenting for myself and on behalf of BritMums and thanking you for taking part.